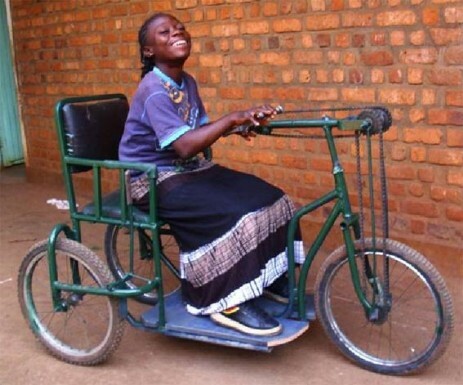 Since 2005, Congo Action has been working in partnership with Pere Andre Thijs , from “Les Missionnaires d’Afrique” and with the association named “ADIPH” ( “ Action pour le Developpement Integral des Personnes Handicappees”), both based in Bukavu, Kivu. They refer to Congo Action hundreds of disabled children and adults, in need of medical and orthopaedic treatment (not financed by the State). 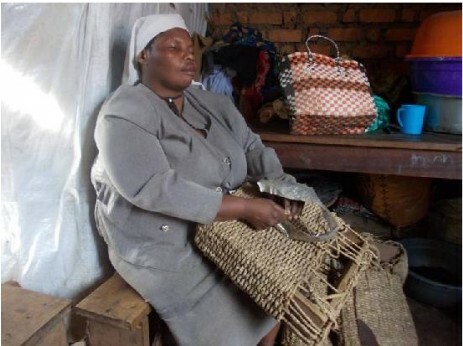 They also refer groups of disabled people willing to better themselves by taking up a trade, (such as sewing, or making handicraft goods) who are in need of financial back up to set up their trade. 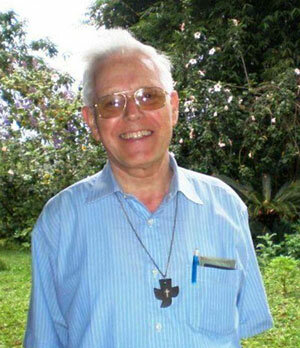 Pere Andre Thijs is a Catholic missionary who has spent 49 years working in the DRC, and remains in active service in the town of Bukavu, Kivu. He works very closely with groups of disabled people, a lot of them having suffered from polio in their childhood. Andre works incessantly at providing help for these unfortunate people, by financing their medical treatment, or medical adaptations, financing sewing workshops and professional training and continually visiting and supporting them morally and physically. 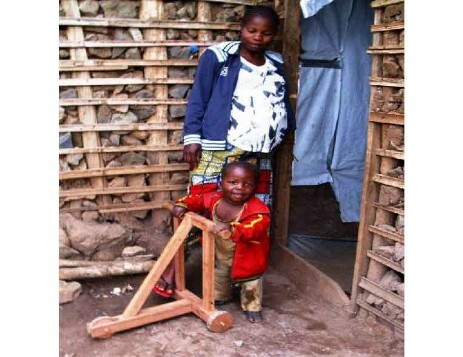 ( The "handicapped " people in the DRC receive no help whatsoever from the government). Congo Action gets frequent referrals from Andre and funds much of his work. We receive regular feedback from the work acheived as well as receipts for the money spent on adaptations and medical interventions. We have just heard the news that Pere Andre will retire at the end of 2016 when he will have had his 80th birthday. Happy retirement and well deserved but we are so sad to see you go! 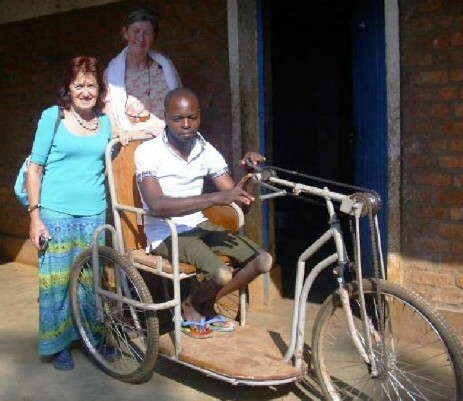 During the recent visit to the Congo Martine and Pat were pleased to be able to visit some of the people and projects Congo Action support amonst the disabled. 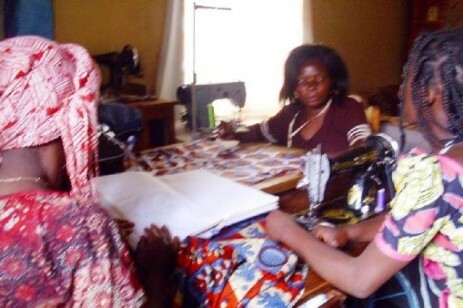 are two of the disabled young girls trained & sponsored by Congo Action in dressmaking. Pat and Martine much admired their finished work! 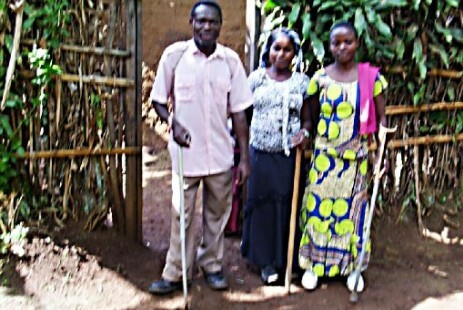 Martine & Pat with Oliver at the home for disabled young people at Nyatende, South Kivu. is from Walungu which is 75 kms from Bukavu. 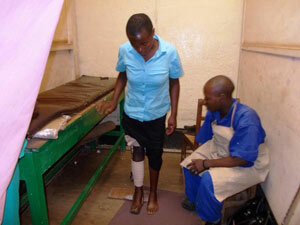 Just after finishing her secondary school studies, Euphrasie lost the use of her legs following an accident. 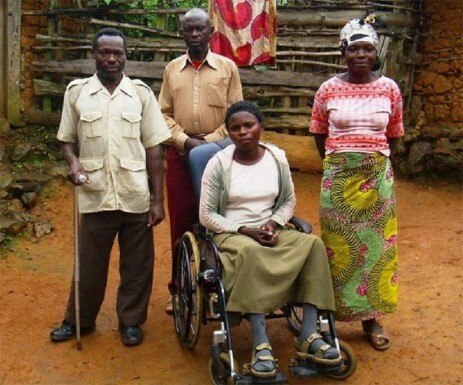 She is seen here with Raymond (left) and her parents receiving the wheelchair recently bught by Congo Action. Ariane was born with malformed legs. 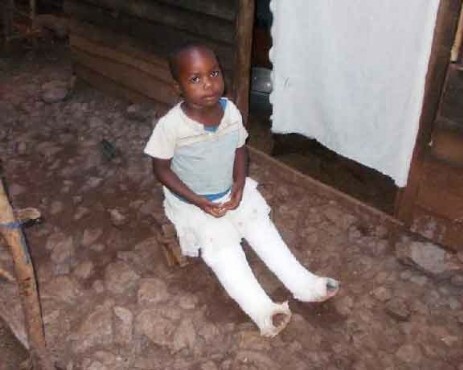 After being brought up to our attention by ADIPH, and Pere Andre, she received financial help for her treatment; Still in plaster casts, and supported by callipers, she was able to start walking some months later. 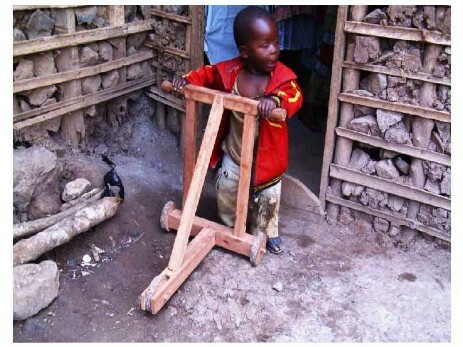 Born with weak leg muscles, Moise was unable to walk unaided. After medical treatment, and legs put in plaster, Moise was provided with a basic walking aid to encourage him to use his legs. Nankafu was paralysed from childhood and unable to walk. ADIPH and Congo Action intervened to provide the necessary orthopaedic treatment. The photo below shows the improvement and self confidence gained after her treatment. She is seen on the right with her friend Immaculee, and “Raymond” our partner from ADIPH. Francine & Evelyne with "Mama Rachel"
Raymond, from ADIPH, visited Francine & Evelyne, in their sewing workshop where they were teaching a newcomer "Mama Rachel". 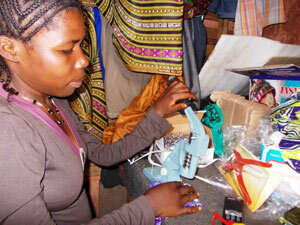 (The sewing machines seen here were provided by Congo Action). 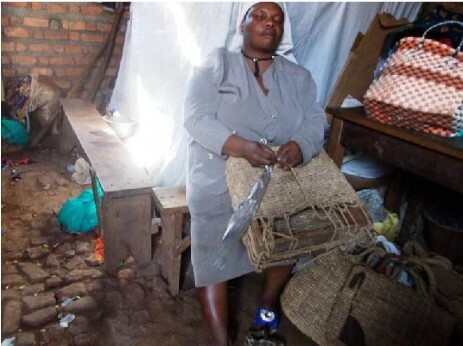 Here is a wonderful example of how very resourceful and industrious disabled people can be, with the little help that they receive: Here, “MAMA BITANGALO” , who is blind, is seen making shopping baskets with materials provided by ADIPH and Congo Action.